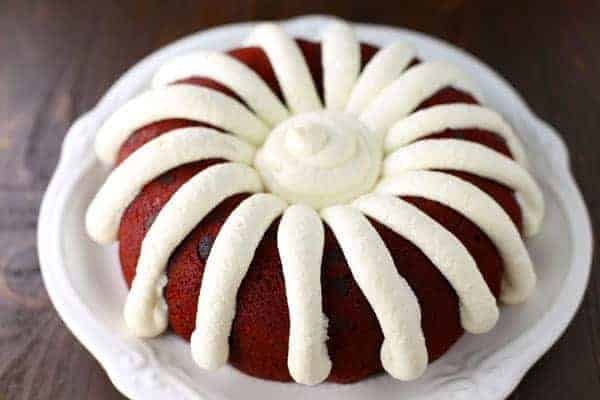 Copycat Nothing Bundt Red Velvet Cake is a red velvet cake with chocolate chips and a cream cheese frosting that tastes like the popular Nothing Bundt cake. Summer is here! Well, not the season but the kids are out from school. Yay for them! I’m so happy they can relax and take some time off. I remember being SO excited for Summer when I was a child. It’s so exciting. But now I’m a parent and it’s a bit different. I love my kids so much and truly enjoy spending time with them, but Summer is HARD for blogging mommies. And also for work from home daddies. It’s very tricky trying to navigate a work from home situation when the kids are home from school! And summer camps are so expensive. I feel like I spend a lot of time trying to entertain the kids, coordinate play dates and basically just doing anything I can to keep them from staring at a computer screen or an iPhone all day long! It’s the big challenge of parents today! But you came here to find a recipe didn’t you! Thanks for letting me get that out. It’s not so bad, just needed a chance to complain a little. I’m very excited that I don’t have to wake up at 6:30 am for a couple of months! 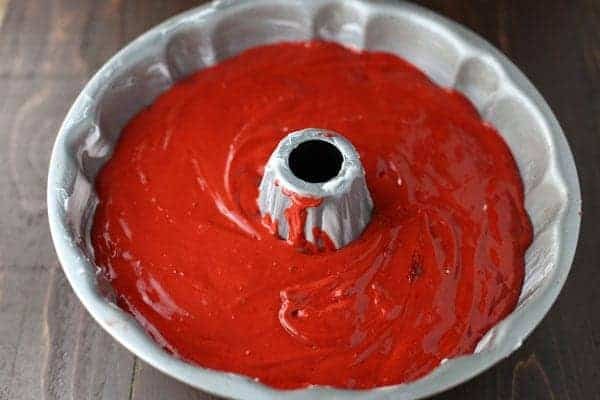 When all else fails, make Copycat Nothing Bundt Red Velvet Cake! 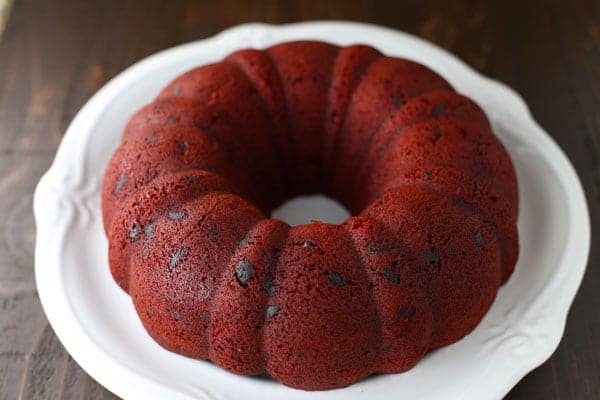 Have you ever had a “Nothing Bundt” cake? They’re super moist, delicious and of course, a Bundt shape. I had one for my birthday and I’m still thinking about it six months later! It’s just that good but I figured I could make it myself. 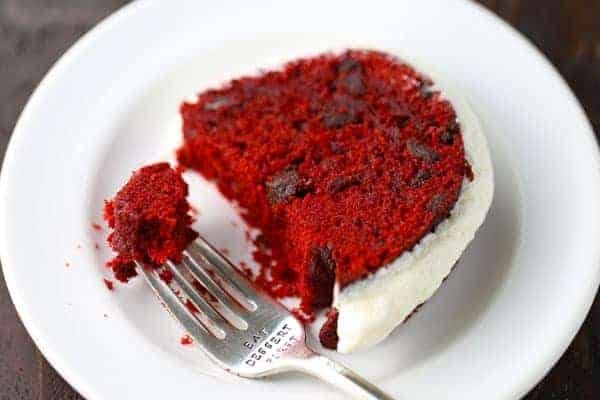 I started with this red velvet cake mix to make it easier. And my secret ingredient to make it moist is mayonnaise! The key to a successful Bundt cake is to grease the pan REALLY WELL before pouring the batter in. I used Crisco and the cake popped out very easily after it cooled. Isn’t it pretty! Then I whipped up my favorite cream cheese frosting which is the PERFECT icing for a red velvet cake! Then I piped long, thick lines of frosting up and down over the cake and a large dollop in the middle in the style of the Nothing Bundt cakes. 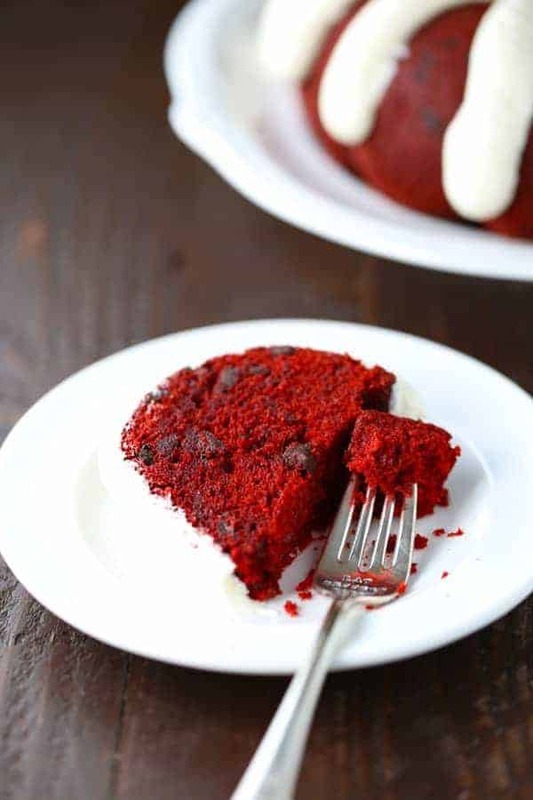 This Copycat Nothing Bundt Red Velvet Cake is amazingly delicious! So good, y’all! It tastes so much like the store bought version, but it’s much more economical! 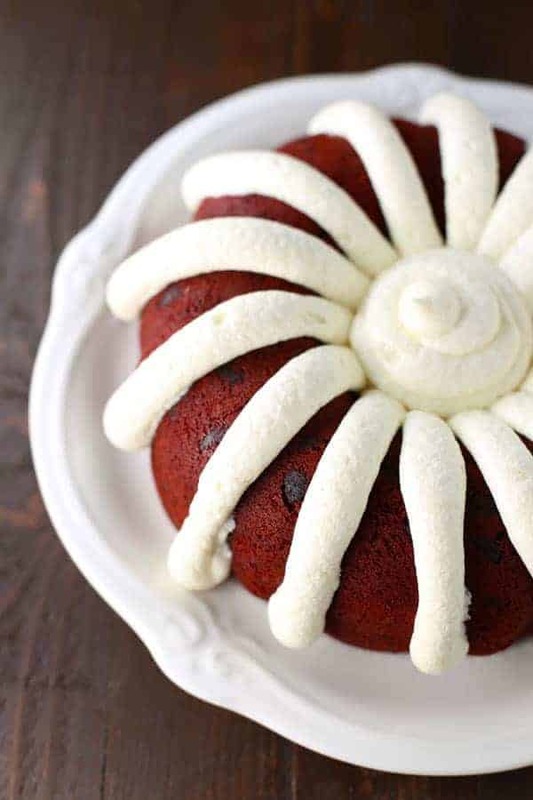 Nothing Bundt cakes are a bit expensive, so why not make one at home! It was fun creating a copycat recipe. Are there any other copycat recipes you wish you had? Let me know in the comments and maybe I’ll create it for you! Preheat oven to 350°F. Grease a Bundt pan. (I use Crisco and lots of it.) Set aside. Place all ingredients in a large bowl. 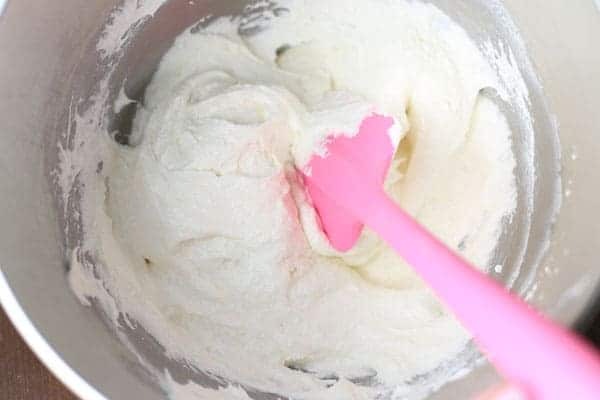 Mix on low with an electric mixer until ingredients are combined, then turn up the speed to medium and beat for two minutes. Pour into prepared pan and bake for 45-50 minutes or until a tooth pick inserted in the middle comes out clean. Let cool. For the frosting, add the butter and cream cheese to a large bowl. Beat with an electric mixer on medium for 2 minutes. Turn the mixer down to low and gradually add the powdered sugar and vanilla. Once combined, turn the mixer up to medium and beat for another two minutes. Pour frosting into a pastry bag fitted with a standard plastic coupler (I used Ateco brand). Pipe onto cooled cake. Serve immediately. Store covered in refrigerator for up to 5 days. This recipe is featured on the Southern Plate Meal Plan Monday. What size bundt pan did you use? Any reason this wouldn&apos;t work as cupcakes you think? I have used your recipe several times. It is delicious! 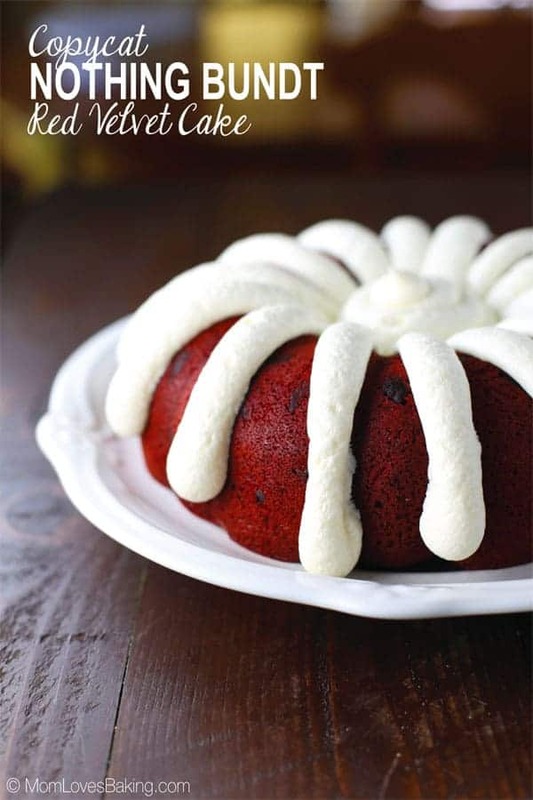 I need a strawberry bundt cake receipe and white bundt cake recipe similar to this one. I think I will try substituting strawberry cake mix and white cake mix in this recipe, leaving out chocolate chips and see how it turns out. What would you recommend? Thanks for sharing! That sounds like a good plan. Let me know how it turns out. Guys, seriously this recipe is AMAZING. I made it in mini bundlets and cupcakes and it was still so incredibly moist and incredible. The chocolate chips aresuch a great addition too. Literally everyone ravesabout these and asked for more Thanks for an awesome share! What was the timing for the mini cakes? How long were the cupcakes cooked? Same temp? Karen – Add any extra batter to a muffin pan lined with cupcakes liners and bake at 350°F for 22-25 minutes or until a toothpick inserted in the middle comes out clean. I’m wanting to make mini bundts too. Glad to know this works in the mini version. Any advice for modifying recipe or cooking tims? Hi! I have one of the ceramic heart cake pans (casserole pan?) from Crate and Barrel. It is large enough for a whole cale mix, but isn’t a bundt pan. Do you guess this recipe will work in it or be too richly wet in the middle to cook? Heart casserole/baker. It did cook through the center, and a bundt pan would have been better. I used standard sized Nestle’s semi-sweet chocolate chips and they sank. It was a tasty chocolate layer at the bottom. I will try the mini-chips next time. One fun thing we did was put the frosting in a piping bag and let everyone apply some to their slice/ it was fun and custom, a memorable end to our B Day dinner. The frosting recipe here is terrific- smooth, easy to pipe. Can these be made ahead of time and frozen? Thinking of trying these for my daughter’s grad party but don’t have time the week before to make them. This is my husband’s favorite cake from Nothing Bundt Cakes. We were not able to get it for his birthday this year, the store was remodeling. I found this recipe and he LOVED it! He said it tasted just like the original. Thank you so much! Yay! Happy Birthday to your husband. So glad he loved it! My daughter is turning 13 and she found this recipe online for me to make for her party. So excited to try it today. Is it imperative that the sour cream and eggs are room temperature? I’m in a bit of a time crunch. Allison – It is best but if you’re in a hurry, it should be ok. I like to put the eggs in a bowl and run some warm water over them for a few minutes if I need to get them to room temperature quickly. You could also put the sour cream in the microwave for 15 seconds or until room temperature to touch. I’d love to see a photo. Post a pic on Instagram and tag @momlovesbaking for a chance to be featured. Hi Suzanne, I think that should work fine. My advice is to grease the pans REALLY well using CRISCO shortening, then dust with flour to make sure they don’t stick. Also, you might want to put the batter in the fridge while you’re waiting for the others to bake. Happy Baking! Tag your photos with @momlovesbaking on Instagram. I’d love to see what your bundtinies looked like. Thanks so much for you advice and quick response! I’m thinking I also need to reduce the cooking time, too! The instructions with the pan said for most mini cakes to fill cavities 2/3 full after preparing pan with vegetable cooking spray and then bake at 325 for 10-15 minutes or until toothpick comes out clean. 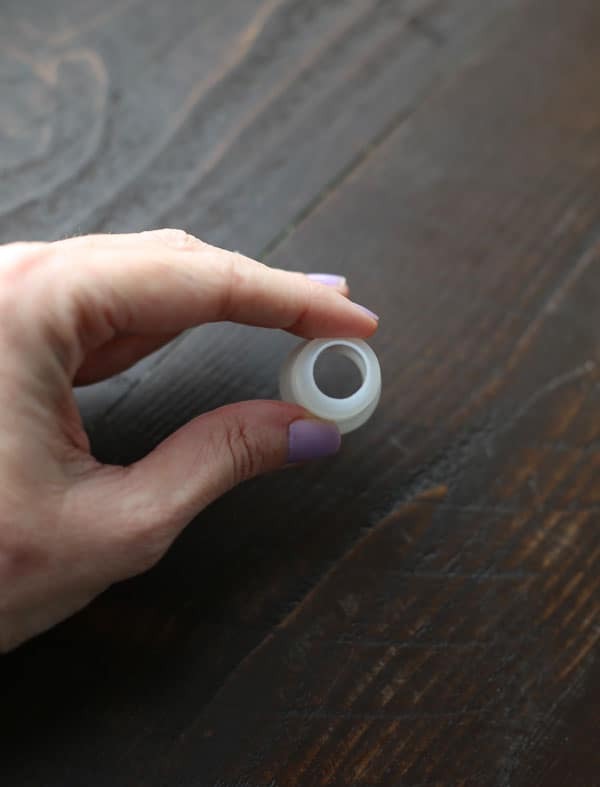 I’m with you….I have better luck with using Crisco shortening making sure I get into all the tiny crevices and then using flour to prepare my pans! On to making 5 dozen red velvet, 5 dozen lemon and 4 dozen chocolate chocolate chip Bundtinies! Will post and tag for sure! Have an amazing weekend! Did you use mini chips in the mini bundtlet cakes? I need to make them for a large event and wondered if the mini chips would work better? How did they turn out. Making some minis tonight. Any recommendations? How long do you wait to flip it out the pan? Hello! 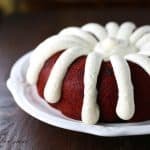 I’ve never tried this recipe before but I’ve been craving a bundt cake and I found this recipe and was absolutely delighted considering I love nothing bundt cakes and red velvet cakes and cream cheese frosting too. So I just wanted to ask is there going to be extra frosting and if so do you think I could put it in a container and place it in the fridge? How long would it be good for if I place the frosting in the fridge? Also how long would the cake be good for and how would I go about to save it? Crystal – I think you could probably use softened butter instead of the mayo but I haven’t tested the recipe like that.